Does your concrete driveway or garage floor have unsightly oil stains? It’s important to remove oil before staining, sealing or resurfacing your concrete. If the oil isn’t removed it will eventually seep back through to the surface and ruin your new decorative treatment. 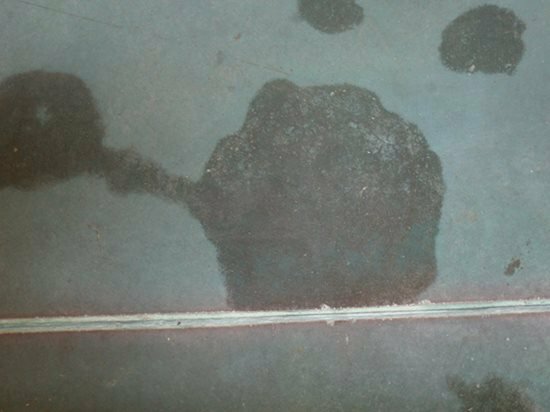 Learn how to avoid this problem by removing the oil stains from your concrete. The wet conditions you experienced caused mold and mildew growth on the concrete. This growth usually occurs in damp or shaded areas that don't receive a lot of sun or heat. Concrete, with all its nooks, crannies and pores, is actually a great incubator for mold. Wet, humid weather with warm temperatures only improves the growing conditions. For the solution, read: Dealing with Mold on Concrete. What's the best method for removing leaf, pine cone and other organic stains like urine, blood or sap from concrete? 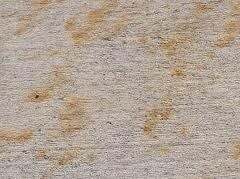 Because organic stains are carbon-based, they tend to be some of the most stubborn stains to remove from concrete. They are not permanent, but they can be hard to remove. The organic pigments get embedded in the micro-pores and small voids on the surface of the concrete. Organic pigments and oils can be very tough stuff, as anyone who has tried to remove grass stains from clothing or clean pine tree sap from hands can attest. One reason you may be having limited success in removing these types of stains on concrete is that you are using the wrong cleaners. Organic stains require special cleaners targeting organic material. Your typical inorganic concrete degreaser, acid or soap will do next to nothing to remove these types of stains. The best detergent to us is one with bleaching action or ammonia. Typically, detergents designed to remove organic stains (blood, food stains, etc.) work best; OxiClean is one example. Granular detergents offer an added benefit, because they provide additional friction when you scrub the surface. The other factor at play is time. Organic cleaners are made up of enzymes and bacteria that actually eat or break down the organic material making up the stain. This digestive process is slow, and most organic cleaners require a minimum of 24 hours and possibly as long as 48 hours to work before you can reapply them. Organic cleaners typically do not affect the concrete color or harm the surface because the enzymes only go after organic material, and concrete is as inorganic as you can get. Organic cleaners are readily available at pet stores (dog and cat urine are the most common organic stains) as pet odor and stain removers, as well as through janitorial supply outlets and online directly from the manufacturers. 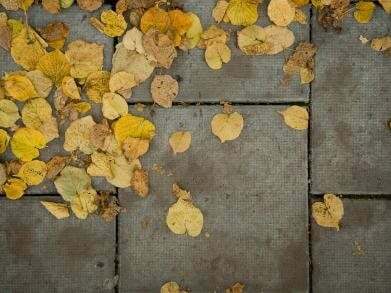 Use a pressure washer to remove all solid leaf matter or debris from the concrete. Apply an organic detergent (as recommended above) to damp concrete. Let it sit for a few minutes. Scrub vigorously with a stiff broom or scrub brush. Rinse the concrete with water until you remove all the soap. If this procedure doesn't completely remove the stains, repeat the process. It's important to note that spot cleaning just those areas where there are stains can result in blotchy concrete. I recommend cleaning the entire concrete slab, or least a larger area, to avoid having blotchy bleached spots. Stains on a concrete patio resulting from plant fertilizer. I have a concrete patio and used a plant food called Bloom Booster when watering the planters on the patio. The next day, I noticed everywhere water ran out of the planters, it stained the concrete. I have tried scrubbing with a brush attached to a power-scrub setting on my hose. What can I do? Plant food and fertilizers all contain metals and minerals such as magnesium, iron, copper and zinc. This list of ingredients reads very much like that of concrete acid stain. In essence, you stained your concrete with plant food. The minerals have penetrated the concrete and reacted with the cement to form a permanent color change. The reacted minerals are not water-soluble, which means water and scrubbing will not remove them. They are only soluble in a mild acid solution. I would start with a clear white vinegar, diluted 50:50 with water, and see if that brings the stains out. You will need to apply the acid solution on the stain multiple times, scrub lightly, and then rinse. Test in a small area to ensure you are getting the results you desire. If the vinegar does not work, you may need to try a stronger acid, such as muriatic. Dilute the stronger acid 40:1 with water. Also, be aware that the acid may etch or change the profile of the concrete in the areas you clean. What's the best cleaning method to use for concrete tubs, sinks and countertops that receive daily use? As a general rule, pH-neutral cleaners are best for concrete surfaces. If you have hard water, use a scum or hard water deposit remover. Do not use aggressive scrubbing pads or abrasive cleansers. Even with cleaning and sealing, concrete will age and wear like any other surface, but this can actually add character since concrete is a natural material. Areas where spray foam insulation dropped on concrete will resist acid stains and dyes. How do we remove residue from spray foam insulation that dropped on concrete from the ceiling above so we can stain the concrete? We scraped off the residue, but will that spot resist stain penetration? What should we use to clean that area? Most spray foam insulation is made from polyurethane. Whether the insulation is pure polyurethane or a new-generation soy-based foam, it will be sticky and expand into and onto anything it touches. When the foam is first sprayed, it’s a viscous liquid. This liquid gets into the pores of the concrete, and as it expands, it is forced deeper into the concrete. In essence, you have foam-insulted the top layer of the concrete, and these areas will resist the stain and show spots when the stain is applied. In some cases, they may even resist the sealer. Scraping away the material only removes the foam that is above the concrete surface. The foam that remains below the surface needs to be removed by chemical extraction. This involves using a solvent or chemical cleaner that will dissolve the foam residue, and then extracting the liquefied foam from the concrete. A solvent like acetone or xylene or an oil-removing chemical usually works to liquefy the foam. But the extraction process is more difficult. Getting the sticky liquefied foam residue out of the concrete usually requires dabbing the area with cotton rags multiple times to try and soak up the residue. Hot water pressure cleaners also work, but create a lot of mess. Foam spots are very stubborn, and even after the cleaning and extraction process, some small stain or spot is likely to remain. I typically tell people that the best they can hope for is to minimize the spot so the stain color is only slightly lighter than the surrounding area. I pulled carpet from a room and then cleaned the underlying concrete floor at least eight times with a trisodium phosphate (TSP) solution. I also used a product from Home Depot called Jasco (a no-rinse TSP substitute) to clean the hard-to-remove glue. I washed the floor several times with water and let it dry. Next, I applied two coats of Kemiko stain with a garden sprayer followed by three coats of Chem-Coat sealer, applying it as directed with a lamb's wool mop and allowing it to dry between coats. Finally, I applied a Chem-Coat protective finish. The floor came out beautiful, but after it dried I saw a small area of the surface where it looked like the sealer or finish coat did not take. It appears as beaded-up water and does not shine in that area. I would like to correct the problem because it's noticeable, but I don't know what to do. Can you offer suggestions? Carpet glue is some of the most stubborn stuff out there. I am impressed that you took so much time to clean it off. Most stain applicators I know would just place a microtopping over the concrete and stain the microtopping vs. taking time to strip off large areas of glue residue. As far as the sealer beading up, it sounds like some remaining glue residue is causing "fish eyeing." This phenomenon occurs when chemical contamination interferes with the sealer's ability to wet out (i.e., penetrate into the surface). My suggestion is to apply several coats of finish wax to even out the gloss. If that doesn't do the trick, you may have to go back and strip and reclean that area. This is a messy, time-consuming job and there's no guarantee it will solve the issue. Usually the application of floor wax does the trick. I used Bean-e-Doo (a soy-based mastic remover) to remove carpet mastic from a concrete floor in my home. The mastic remover has left an oil/grease stain pattern all over the floor. What product is best to remove the stains? A good soap and water cleaning using a concrete alkaline degreaser soap should help. You should be able to get a concrete degreaser at a hardware store. I have concrete pavers and bricks in my backyard. The problem is I am getting moss growth on them. I powerwashed the moss away last year, but it's back again this year. Do you know what's causing this to happen? Bricks and concrete pavers are very porous, like sponges. They hold moisture, and thus are great little incubators for all kinds of plant life, especially moss. My guess is you live in a warm and humid climate. You will need to apply a weed and grass killer to the moss and then aggressively power wash all the plant matter away once it dies. Let the pavers dry, and then seal them with a product designed for concrete pavers or brick. This should eliminate or at least greatly reduce the problem. It may take several coats of sealer to completely fill all the pores in the pavers. What is the best way to prevent stains from construction-related activities on a newly poured slab intended to be an exposed concrete finish (other than hounding the GC to be tidy)? I'm worried about contamination by muddy footprints, rainwater/clay runoff, rusting rebar or tin cans left on the concrete surface, and slurry from sawcuts. What combination of hardening agents, sealers, or protective temporary coverings (polyethylene, burlap, etc.) yields the best protection without adding undue expense? Use a cure-and-seal as part of the finishing process. This provides a good cure and leaves behind an acrylic membrane to protect the floor from typical construction traffic and debris. A cure-and-seal will cost about $0.04 to $0.08 per square foot, depending on the type of product used and the job size. However, it could limit how you finish the concrete and what type of topcoating you can apply. Be sure to confirm that the cure-and-seal is compatible with whatever final finish or coating you plan to use. Use a physical barrier like Builder Board from Surface Shields. This is a great, relatively low cost method to really keep the floor clean and protected. This will cost more than the first option, but is far superior in protection. These boards also come in water-resistant versions if you are concerned about water exposure or chemical contamination.